Gorgeous scene of a field and trees, isn't it? Contrary to popular belief, the focal point of the image is NOT A TREE. Odd and obscure, I know, but please believe me when I say with absolute certainty: this may be the single most important concept for a growing artist to comprehend. Period! FORGET EVERYTHING YOU THINK YOU KNOW!! No joke. Say what?! Of course it’s a tree! One of the hardest things to do is to learn how to "see" like an artist. This involves, among many things, the ability to forget everything we've associated with images all of our lives. We bring to visual stimulation a full lifetime of non-artist associations and definitions of how we observed things. We know what a tree is and have a preconceived notion of what that looks like. To most, I image it is the image on the left below. The first challenge to seeing as an artist is to think of this as a SHAPE and not as a tree! You need to see that "tree" as a large MASS as shown on the right below. Once you see the shape of the tree, you can begin to dissect the shapes within the large shape. There are many nuances within the large mass and values distinguish one of the most important. This is shown by the image on the left below. In this, you can identify the sub-shapes that represent a lighter value (where the sun is hitting), the medium value (the shadow), and the dark value (highlight within the core of the tree). Once you begin seeing the individual shapes within the mass, you can work to simplify them as shown in the image on the right below. Here, you can see the value masses are connected making the overall image more organized. Once you get to this point, you can begin focusing on the nuances of how each shape differs from the other. Within each value mass, are things warmer/cooler, are edges harder/softer, are colors more intense or saturated, do lines need to be simplified, etc.? These nuances make the image rendered by an artist begin resembling a tree. 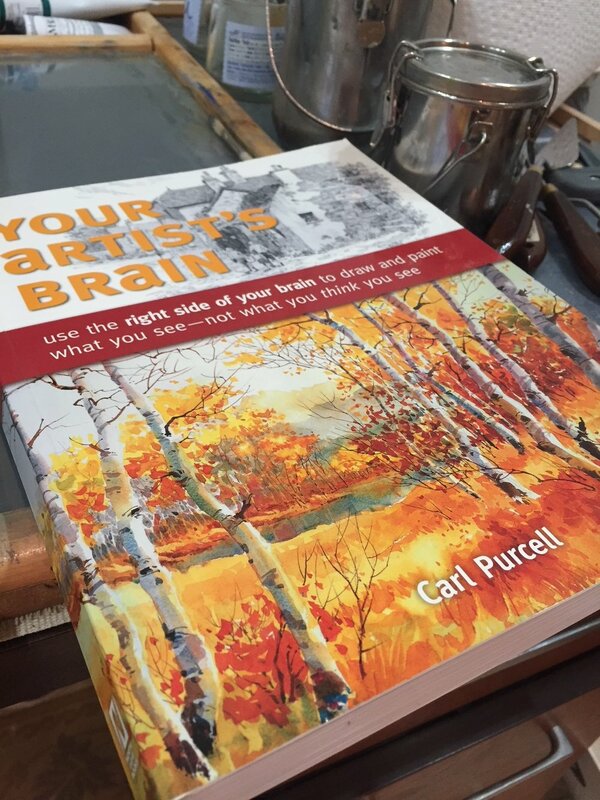 To help break down conventional observations into seeing like an artist, I recommend the book "Your Artist's Brain" by Carl Purcell. This book is an outstanding resource to help retrain the way you see. It's main premise is to understand the distinction between how the left and right sides of the human brain function. In very naive terms, the left side of your brain is generally considered to control the order, structure, and logic ("intellectual brain") while the right side controls creativity ("observation brain"). Said differently, a "tree" is how the left brain understands the image above while the right side sees it as shapes. Understanding these very fundamental differences allows an artist to begin visualizing things as observations and shifts priority to the relationships between shapes, lines, angles, values, etc. Through a series of incremental chapters and corresponding exercises, Purcell starts pointing out topics and main themes that are critical to an artist developing the power of observation and reversing the visual definitions our brain developed over a lifetime. Trust me, the practice is not easy. With practice and forced observation, it is possible to change the form of observation. For me, this was the single-most important fundamental to grasp and now I consciously think in terms of the shapes I see that collectively make recognizable images. I'd love to hear your thoughts and practices to help see in shapes!